This pork rice dish tastes absolutely delicious. It’s very simple to make, and doesn’t need to stand in the kitchen very long to cook it. Fish sauce is the key ingredient in this dish, creating a lovely umami flavour and gives the whole dish a unique note. Beware that some brands in the market are quite salty. After trying a few brands, I finally settle on the Three Crabs brand. 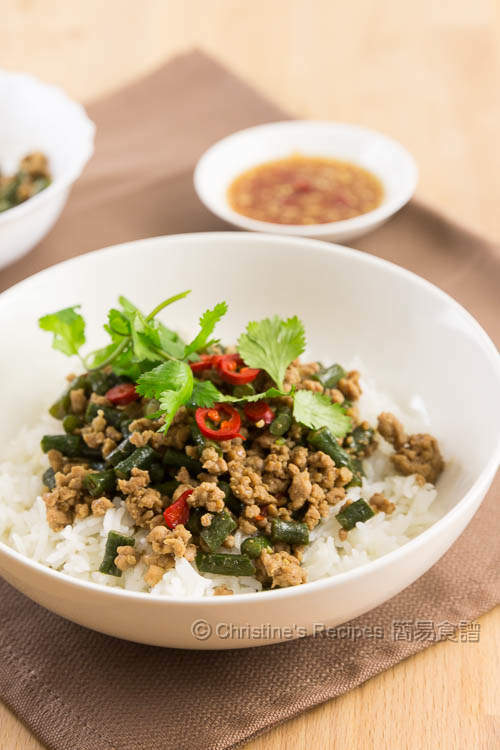 I like to enjoy this delicious dish with a bowl of hot steamed rice. Any leftovers can be packed into a lunch box with lettuce or cucumber chunks for the next day. Combine all the sauce ingredients in a small bowl. Set aside. Heat oil in a wok or frying pan over medium-high heat. Saute garlic and chilli until aromatic. 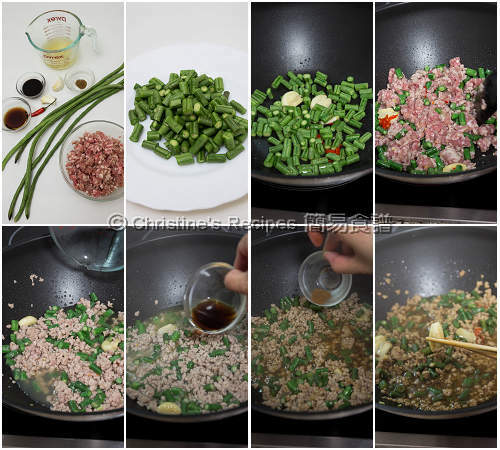 Add the diced snake beans and stir-fry until dark green. Push to the sides of the wok. Add more oil in the middle. Add pork mince and cook until brown. Pour in the stock and bring it to boil. Reduce heat and simmer for 3 minutes. Mix in fish sauce, sweet soy sauce and five-spice powder. Season with salt and pepper. Test the taste. If satisfied, stir in the thickening and cook to your preferred consistency. Transfer on top of steamed rice. Garnish with coriander. Dress as much sauce as desired. Serve immediately. I used ABC Indonesian sweet sauce and Three Crabs brand fish sauce, available at Asian grocers and supermarkets. The bird’s eye chilli is quite hot. 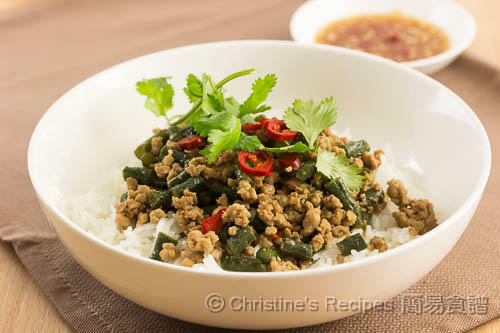 You may skip it or use long red chilli, the not-so-hot kind instead. You might like to discard the crushed garlic before serving. I surely will ask for a 2nd helping of rice. The mince looks so moreish.